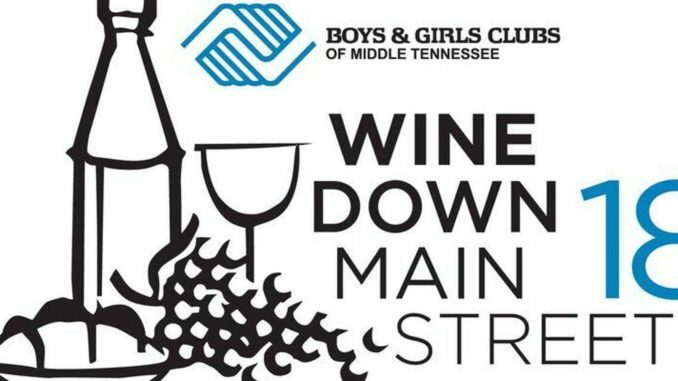 Wine Down Main Street is Saturday, November 3, 2018, at the Historic Square in Downtown Franklin and along Main Street. This event is a Ten Time Sizzle Award Winner for Best Fundraiser/Charity Event in Williamson County! So mark your calendars, call your friends and book the babysitter, Wine Down Main Street 18 is set for Saturday, November 3rd. The “Best Night Out All Year” will take place from 7:00 to 10 PM. Lipman Brothers, Nashvilleâ€™s oldest and largest distributor of wine and spirits is the official Wine Sponsor. This unique wine tasting event takes place along historic Main Street in Franklin, Tennessee. Just 20 miles south of Nashville, more than 30 shops will play host to wines from around the world. Participants taste wines, shop, and sample food from area restaurants all while listening to great live music. Proceeds from sponsorship’s and ticket sales for this event benefits the more than 4,000 local youth served by Boys & Girls Clubs of Middle Tennessee.